Looking for a place large enough to gather your entire group? Look no further. With two fully-equipped kitchens, two dining areas, and two living rooms, everyone can spread out and have their own space. And no one gets left out in the cold - this gem even has two hot tubs! Escape to luxury and comfort in this well-appointed over 5500 sq. ft. home built for a large family or large group of friends! Bear Hollow Village is conveniently located near the shopping, ski resorts, and restaurants. Learn to bobsled, skeleton, and freestyle like an Olympian at the Utah Olympic Park. Enjoy everything that park city has to offer. While staying at Bear Hollow Village, you are only minutes away from Park City Mountain Resort, Deer Valley Resort, Canyons Resort, and historic Main Street. Take your taste-buds on a epicurean adventure at any of the world renown restaurants and taverns. and a stones throw to the Olympic Sports Park! This home has a spacious master suite with king size bed and jetted tub, 5 bedrooms with queen-sized beds, and bunk beds. There are 3 floors of gracious living spaces! Parking is never an issue here, with an over-sized parking garage, large driveway and plenty of street parking to accommodate everyone that comes to visit. 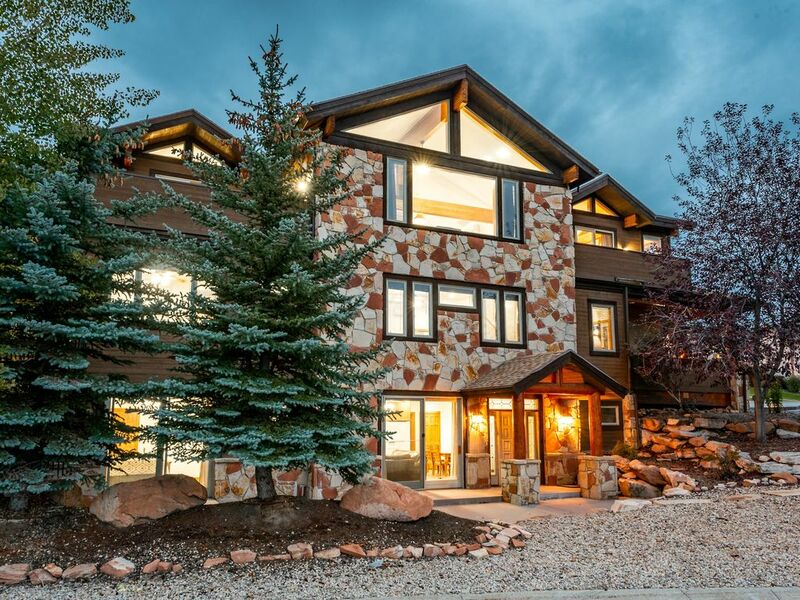 Whether you come to Park City for the skiing/snowboarding, Sundance Film Festival, or enjoy the equally attractive summer weather, you will enjoy this great location and great house. During the spring, summer and fall enjoy watching hot air balloons launch right from the deck. Leaving nothing to be desired... this home is just a phone call away. CALL OR E-MAIL NOW! We love Utah and Park City. We enjoy skiing, hiking, and mountain biking. Our house is conveniently located within 15 minutes of three major ski resorts (Park City, Canyons, and Deer Valley) and within an hour of more than a dozen. Our location is also close to shopping, restaurants and within 45 minutes from Salt Lake City airport. Great for multiple families with two full kitchens, pool table, two outdoor hot tubs, large open space for entertaining and separate space for kids. We have just remodeled with new bed linens, drapes, carpets, flat screen TVs and more! Five and half bathrooms includes private full baths in master suite (king) and two of the queen bedrooms. The two other full baths are shared between two bedrooms. Radiant floor heating, great for keeping feet and house warm. Heat pump/AC in all bedrooms. 2 Car Garage Oversized garage can hold largest SUVs including roof racks for skis. Large dining are with table for 10. Additional tables on deck can be moved to dining room for additional guests. Additional folding chairs in the master bedroom closet. Snow shoeing, sledding and more!